Was there ever a more thrilling ensemble? 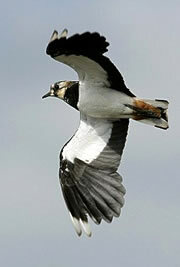 But the rolling tumbling, death defying lapwings. the redshank that pipes and dips from the wall. percussion, the humming, thrumming, drumming of roller coaster snipe. take silent ownership of cup and ring. Design for Living? No, No, No, Noel! So why isn’t it easy? Why shouldn’t people be free to love whom they like when they like? Why do people get hurt? Why do they feel guilty? Why does it always turn bad? Gilda is one of those delightful women, beautiful, intelligent, impulsive; a loving and free spirit with a real zest for life. Otto and Leo are two sensitive and sensuous young men, who are both enjoying the exhilaration of success. Otto is a painter; Leo an up and coming playwright. They are young, and in love. Gilda first chooses Otto and they live in a romantic garret in Paris. Then Leo returns after a successful run in New York and she abandons Otto to live with Leo in London. Then a year or so later, Otto returns and after a steamy night, she leaves them both and the next we know she has married the older, safer and rather tedious Ernest and become established as a New York socialite and art dealer. Meanwhile, Otto and Leo get drunk, realise how much they love each other and go off round the world on a sequence of slow boats. Two years later, they turn up in Ernest and Gilda’s apartment in New York, whereupon Gilda decides to leave Ernest and live with Otto and Leo in a ménage a trois. It is all so wonderfully romantic and amusing – so Noel Coward! But is this so much a design for living as a strategy for loving? And will it ever work? One feels that it’s alright for Gilda. She has the attentions of two handsome, successful young men who both adore her, but how will she cope with their love for each other? It may be so exciting for the moment, but what will she do when they both get a bit fed up with her attention seeking and want a bit of basic male bonding? Go off to Ernest again? And can you imagine all three of them in bed together; the competitiveness, the jealousies? Which of the men will go first and where? How will she hold them together? How will she satisfy two enormous egos? For this to work, it would mean them all being terribly responsible and level headed. When has Gilda ever been level headed? It’s not so much that it’s morally wrong. It is, of course, but morality is a social construct; there to protect us, not just an edict to be ignored. Any one of us can love more than one person deeply, but it is impossible to maintain an intimate relationship with two people for very long without resorting to a whole complicated web of secrecy and deception. When people fall in love, they expose the most vulnerable aspects of themselves. It’s a courageous act of absolute trust and it risks nothing less than devastation of the personality through destruction of meaning. Gilda and Leo and Otto may think they may have acquired sufficient experience and wisdom to maintain a stable triangle, but it takes enough time for any of us to sort out a relationship with one other person; how much more effort would it take to sort out a three-way intimacy? And how long would it last without resorting to the rot of deception. And finally, would it be worth it? Some of the recent literature to come out of the middle east, illustrates the complex jealousies of polygamy. I can’t see polyandry being any better. Still, it’s wonderful entertainment and any good art; it makes you think. Design for Living by Noel Coward is currently playing at The Old Vic. Lisa Dillon is delicious and delightful as Gilda (and that dress! ), though it was clear who was in charge. The actors who played Otto and Leo were less credible. And one had to feel some sympathy for Ernest, though his marriage to Gilda seemed less a meeting of minds and souls than a business arrangement, a mutual exploitation. It was originally banned from performance on the London Stage. Is sequencing the human genome an answer for IBS? In the beginning was the word and the word was ACGT – life encoded in combinations of three out of a possible four nucleotides; Adenine, Cytosine, Guanine and Thymidine. 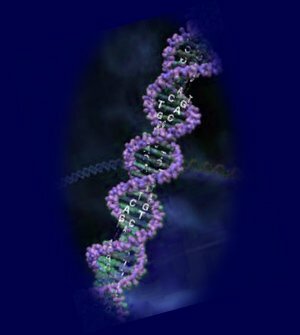 This year is the 10th anniversary of the sequencing of the human genome. At a stroke, it would appear, a new perspective on health and disease has opened up. By comparison of genomes from different individuals, it may be possible to identify the risk of getting disease and, armed with that knowledge, make the necessary changes in diet, lifestyle, and exposure to chemicals that would reduce it. But genes encode for proteins, not for diseases. But we only know about defects in specific proteins in a few rare diseases. In Duchenne muscular dystrophy, for example, there is a defect in the synthesis of a key protein known as dystrophin. Common diseases like irritable bowel syndrome are likely to be the end result of an interaction of a number of factors, each with their own genetic and environmental regulators. And since IBS overlaps with other diseases as well as anxiety and depression, any genetic component will most probably encode for a protein incorporated in some generic factor involved in visceral sensitivity or emotional reactivity. In addition, genes may predispose to an illness but only in combination with other genes and changes in the environment brings that tendency out. For example, environmental change induces growth and connection of nerve cells by regulating gene expression. And this can affect every system in the body. It’s all very complicated. Any advance in knowledge rarely provides simple answers, just a vast array of unforeseen questions. Only 1% of the genome encodes for specific proteins, about 20,000 of them – the same number as in a nematode worm. Ten times as many are regulator genes, that are turned on and off by environmental factors and modify the expression of certain genes. Anything that changes the expression of transmitters, modulates intracellular machinery, and induces growth and cell division will involve regulator genes. These then are the targets for treatment and prevention. The remaining 90% of the genome is thought to be junk, DNA fragments, stuff left by some viruses. Scientists have found no use for it as yet. Genetics, like human life, is a bit of a mess, not unlike the hard drive of your computer, which contains bits of everything you’ve deleted or copied. So the sequencing of the human genome hasn’t resulted in the dramatic breakthroughs that were expected. Part of the problem is that it takes a long time to sequence the genome from a single individual and everybody’s genome is different. At the moment, gene sequencing is rather like tearing a book up into fragments of page, sequencing these and then putting them together again, but with new methods of sequencing coming on stream, things will be much quicker. In five years time, the cost of sequencing somebody’s genome will be as little as £1000 and we will have a much better handle on the nature and function of the regular genes. Then comparison of genomes from people with IBS will be feasible. But will we be any closer to finding a cause …… or an answer? Is democracy the best way out of crisis? Well the people voted and no one single party won. It’s a hung parliament and the conservatives and liberal democrats have combined to form a coalition government. We have got the government we wanted or rather we have not got any of the governments we didn’t want. Now politicians or at least little over half of them have a chance to work together to solve the economic crisis. Perhaps we have seen the end of the boo – rah, rah adversarial politics of the past and will achieve some concensus. This is democracy in action, but is it the best system to solve our problems? Democracy is accountable, but to whom; to an electorate informed by media and over influenced by the personality of the leader? Western democracy suffers from populism; it cannot make sacrifices, take the difficult decisions because it will be voted out of office. People expect to be more comfortable, better off; they will only support a government that has to make economic cuts as long as somebody else bears the sacrifice. The media support the rights of the masses and will soon whip up a storm if they do not get a good deal. When Tony Blair realised that the Iraqis were not producing weapons of mass destruction, he declared that they were fighting a war to restore democracy in Iraq. But is that what they wanted? We might argue that under Saddam Hussein, Iraq had the government it needed – at least for most of the time. Saddam was seen as a strong leader in the Stalinistic mould. He not only improved the prosperity of Iraq but he enhanced its stature among Arabic nations and throughout the world. In the late nineteen eighties, my Iraqi students viewed him as a hero. But like every dictator, he over-reached himself. He declared war against the Kurds, the Marsh Arabs, Iran and finally Kuwait. That was a step too far; Kuwait had oil. Suddenly Saddam was a dangerous tyrant. But having got rid of Saddam, is Iraq ready for democracy? The problem is unless a country is ready, democracy can so easily lead to reactionary politics; the overthrow of one system for another – the tyranny of the majority, more conflict. Democracy cannot be equated with individual liberty. But what is the alternative – a self imposed oligarchy of the great and the seemingly good? Perhaps but some system of checks and balances must be imposed to govern the government otherwise the system will be liable to corruption. In the middle ages, it was the church who kept an eye on states, but this didn’t stop some monarchs setting themselves up as leader of the church as well and it didn’t stop priests abusing children. The other evening, I went to see a video documentary on the 2007 riots in Burma, filmed by under-cover journalists, who smuggled their footage out of the country. It demonstrated the panic- stricken defence by a government that had boxed itself into a corner by refusing to negotiate and had to react oppressively to restore order. Once the monks and the people started marching, the outcome was predictable. We might argue that what a new country needs as it learns to vote and rule itself is a system of monitoring or parenting, by another state. But isn’t that just colonisation by another name. And which state will parent Burma? Not the west for sure, not Japan; memories run deep. So will it be China or India and won’t that just shift the risk of conflict to a larger arena? Love and Glory; The wondrous madness of it all. It is 1885 and there’s trouble in the Balkans – as usual! Sergius, so ambitious for glory, leads a foolhardy cavalry charge against the Serbian machine guns. He’s not to know that the Serbians had been issued the wrong ammunition and could not retaliate. So his glorious charge scatters the enemy, who disperse into the countryside. The population are advised to keep their doors and windows bolted, but Bluntschli, a Swiss mercenary , shins up a drainpipe into stumbles into the bedroom of Raina, who is not only the daughter of the Bulgarian commander , Colonel Petkoff, but is also betrothed to the heroic Sergius. Raina is moved by Bluntschli’s fear. She gives him chocolate creams to eat and hides him. He falls asleep on her bed. Raina and her mother, Catherine, then help him escape by disguising his uniform under their father’s old coat. A few months later, peace breaks out and Petkoff and Sergius return from the war. Bluntschli, who has been promoted captain, calls to return the coat. It’s the stuff of farce. Petkoff and Sergius must not know their wife and fiancée concealed a deserter, but how can the return of the missing coat with Raina’s signed photograph,’ to my chocolate cream soldier’, in the pocket. But Petkoff and Sergius are more bluster than brain. They welcome Bluntschi as an honourable foe and use his practical abilities to help them organise the demobilisation of their troops and horses. Bluntschli is a professional. For him, war is a job of work. He keeps his head down, does his duty and waits for the peace. By comparison, his erstwhile opponents appear ridiculously pompous. 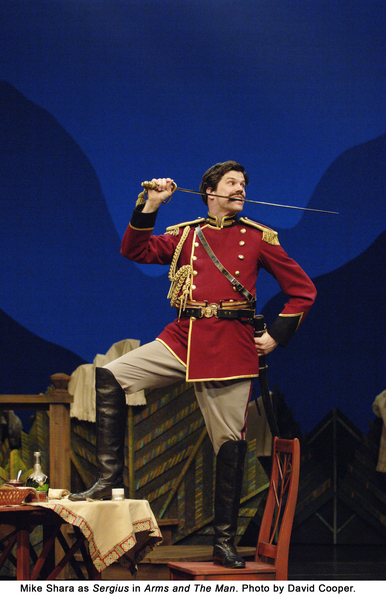 Petkoff is actually scared of his troops and wants nothing more than to retire to his country house. Sergius is a liability. He would sacrifice the safety of his troops in his desperate quest for personal glory. So much for honour! But what of love? Sergius is not in love with Raina; he does not know or understand her. Besides, he can’t keep his hands off Louka, Raina’s wily, cynical maid, who sees the little boy inside and is more of a challenge. Raina, meanwhile, has developed a soft spot for her chocolate cream soldier; he understands her and makes her laugh. Even her parents are won over when they learn of his inheritance. In ‘Arms and the Man’, George Bernard Shaw points a satirical Irish finger at the ridiculous hypocrisy of honour and romance. As Bluntschli explains, sensible people are frightened, they lie, they deceive, they pretend. They may like to think themselves honourable but faced with mortal danger, they will do all they can to stay alive. Only the mad will sacrifice everything for love and glory. What Shaw is writing about, in cold psychoanalytical language, is narcissism. Sergius doesn’t love Raina; he is merely in love with the reflection of his own image in her eyes. The beautiful and spirited Raina makes him feel much more of a man than he knows he really is. He lacks confidence and can only gain self esteem by exciting the admiration of others. He lives in the regard of others. It is his life blood. Without it he dies. His need is so desperate, he will risk everything, even the lives of his men, the future of his country. He even feels compelled to seek regard in the cynical arms of Louka, though he knows that she will be the one to destroy him. An overweening desire for fame and celebrity is always accompanied by a tendency to self destruct. Think of George Best, Gary Glitter, Paul Gasgoine, Jade Goody. And for Raina, the commanders daughter who cannot go to war herself, Sergius is the embodiment of her own inbred projections of bravery and honour, the only man worthy of her love; it’s glory by proxy. The narcissistic love object has to be impressive; it doesn’t work otherwise. Raina is in love with how the attentions of so brave a man can make her feel adorable, admirable, desirable, loveable; all a self centred woman could even want. So are we to believe that romance and glory are but the delusions of a fragile psyche, make believe; the stories we tell ourselves in order to conceal a reality we can’t accept. Bluntschli explains that humanity is never that wonderful or glorious, but he’s an administrator, the son of a hotel owner. But do we always want to be that sensible? There’s no meaning in that and life without meaning is not worth living. Don’t we need make believe too? If not, what would be the point of literature, music, the visual arts? The moments of madness, falling in love, crazy projects, bring us life and permit change. Banish them and we become depressed and die a little more. But contain them, allow our healthy narcissism, our self confidence and esteem to receive nourishment of novelty from friends and family and who knows, we could even be happy. ‘Just follow me dad!’ Alex reached the end of the lane and then turned left into an relentless wall of oncoming traffic, easing his bike across the path of motos, tuktuks, cars and trucks which just turned a little to miss him without altering their steady 20 mph, until he blended in with the flow of traffic going in our direction. 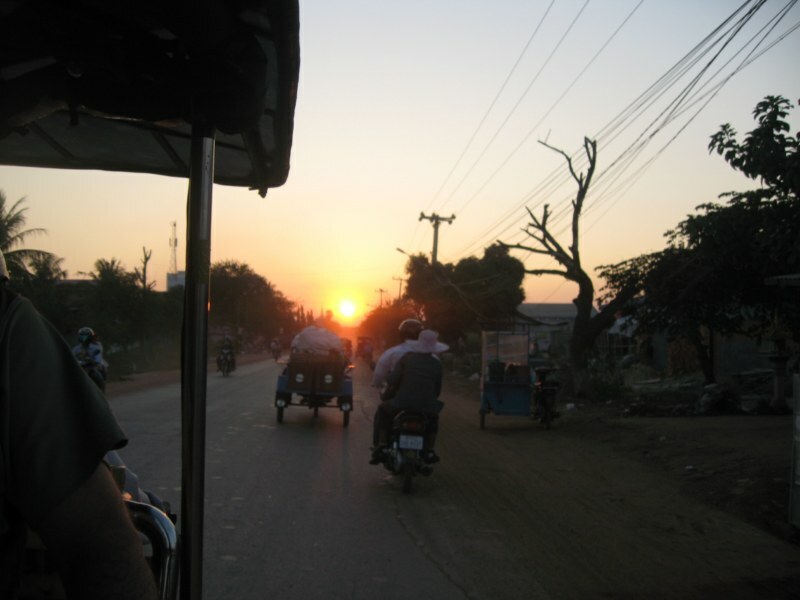 It’s an experience driving in Phnom Penh. There are few traffic lights and roundabouts and no obvious rules. Drivers and cyclists just seem to know how others will behave and avoid them as they would just as if they were walking along a crowded pavement. It’s the same if you want to cross the road on foot. Just step out into the flow and keep walking slowly and deliberately so that nobody has any doubt of your intensions and they drive round you. Despite the volume and chaos of traffic, we saw just one accident, when somebody fell of their moto at the side of the road. Drivers are not neurotic in Phnom Penh. There are no stops and starts, no irritations, no speed merchants, no horn honking or shouting just a blending into a steady inexorable flow of traffic. Everybody seems to know what is expected. But the way, they drive their motos looks incredibly dangerous; police in England would have a field day. Mothers balance children on the handlebars as they drive one-handed through heavy traffic. A family, a little baby sandwiched between mother and father, careers along in the flow. A man controls his moto one-handed while wheeling a bike with the other. Another balances a big water tank on the handlebars and peers round the side of it. Sundays evenings are the busiest time. Then everybody seems to go for a ‘promenade en moto’. It’s the time to see and be seen. Men ride upright in shiny suits while their women sit side-saddle in their best pyjamas. And their children stand up on the seat in their designer football strips and wave.